WARKWORTH - The story of one of the area’s first highways, the Percy Portage, will be told in two- and three-dimensional form in a Warkworth exhibition whose opening reception is Saturday night. 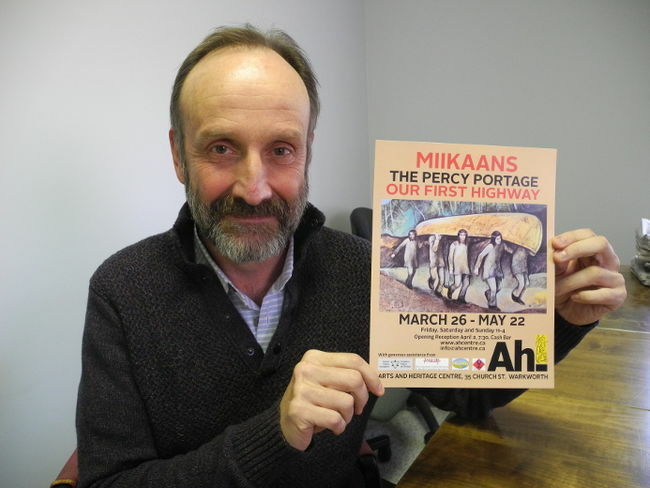 Mikaans: The Percy Portage runs through May 22 at the Arts and Heritage Centre at 35 Church St., complete with a curator thanks to a grant from the Ontario Trillium Foundation. “It’s a recognition of what we consider a very important regional heritage feature,” according to Stewart Richardson, one of the show’s organizers. One will be set up in Meyersburg, just south of Campbellford. The other will go at County Road 45 and Richardson Road. “To the best of my knowledge, this is only the second or maybe third plaque designating an actual First Peoples portage,” Richardson said. The Mikaans exhibition includes a canoe from the Canadian Canoe Museum in Peterborough, as well as an assortment of artifacts and carving tools that give a picture of the early history of the area along a route that became the first road used by the early European settlers in the early 1700s.